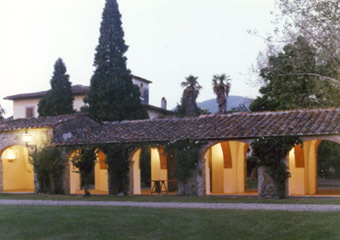 The farm complex used as a holiday resort consists of a villa and three apartments bearing the names of their ancient inhabitants (Nello, Bruno and Cerini) adjoining the villa. The apartments are fully independent but may be, if necessary, connected to the villa to form a single unit. The family also owns the beautiful wood of Frugnolo, located only 5 miles away from the nearby hamlet of Rigutino, up on the hill travelling towards the park of Lignano. This is a very particular place featuring a wood of Douglas fir, a rare species in this area. The fir-wood was planted by Carlo Sandrelli as early as in the first half of the 20th century and may be viewed due to its peculiarity as an essay of Tuscan agronomic history. Carlo Sandrelli also had the charming cypress-tree lined road built that once, passing by the ancient Pieve della Sassaia located above Rigutino, connected the lowe valley with the Monte Frugnolo. This road, still visible from the current road, may be travelle don on foot for those wishing to go for a hike. Guests will be able to find here an ideal place for long, relaxing walks and take advantage of the services and facilities offered by the park of Lignano to go for a picnic.